Most parrots (not only parakeets) will eat seeds if a variety of foods are offered. Seeds are high in fat and low in most of the nutrients which are necessary for good health. Some veterinarians compare seeds for birds to junky foods for human. Budgies that eat only seeds can suffer from malnutrition, obesity, liver disease even though they may look healthy. Seeds should be offered for budgies in a small amounts, but not as a total diet. Pellets is a blend of many nutrients. 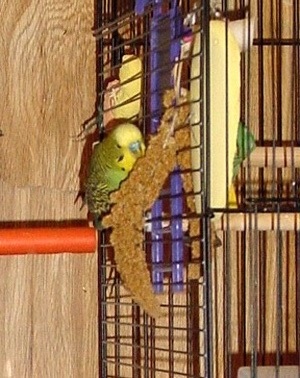 They are high quality food and low in fat, but they're not only food you should feed your budgie. It's best to provide parakeet with variety food: pellets, fresh vegetables, small amounts of fruit, table food (cooked beans, whole wheat bread, cooked rice, pasta, eggs) and seeds. Budgie should eat about 1 tablespoon total amount of pellets per day including 1/4 tablespoon of seeds. Vegetables and fruits are important part of healthy parrot diet. apples (without seeds), bananas, all berries, cantaloupe, figs, grapes, kiwis, mango, oranges, papayas, peaches, pears, pineapple, plums, tangerines. Remember to remove all seeds and pits from froits. They are toxins for budgies. Guess what we have for dinner today! Those above are examples of the foods safe for parakeets. My Munchkins somehow love to chew broccoli and spinach. Fresh fruits and vegetables give your bird natural vitamins, fruits should be given occasionally or as a treat, because of high sugar level and moisture that can lead bird to diarrhea. My Coconut is a nectarines lover, he makes them disappear very fast! Vegetables and fruits have to be fresh, clean and free of any pesticides. I often buy organic greens. Don't forget to remove all leftover veggies/fruits food from their cage after a while. Veggies and fruits may be frozen or cooked, but not canned. Of course unfreeze them before serving. Budgies can and should eat healthy table food with few exceptions. Good example and often eaten by budgie with pleasure are boiled eggs. They offer a lot of nutrients. Another examples: wheat or grain bread, cooked rice, pasta, cooked beans. Your budgie should have container with fresh water in his cage/aviary. You have to absolutely keep food and water containers clean. Change the water daily, even two or three times a day. Some stores offer special liquid vitamins, which you mix with water. Vitamins are most often not necessary and you can overdose your budgie on some vitamins. Mineral blocks or cuttlebones are rich in calcium which is necessary for your budgie good health. They are also helping them to file their beaks and keep them busy. Parrots love millets! You can find different millets in pet stores. Millet is very high in fat and that's why you should give it to them occasionally or as a treat or reward for good behavior. Some birds reject some food, but they may be willing to taste it when it is cooked or grated or sliced. I observed that my Munchkins more likely eat vegetables that are hanging in their cage. Never change your budgie diet suddenly ! Budgies can starve themselves to death. Be patient and persistent with adding different kind of food to your budgie diet. Keep reminding yourself that this is for your bird's own good, it will keep your budgie healthy.